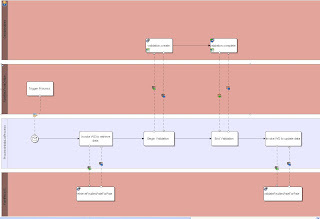 In my company, we've been considering, for a while, integrating a BPMS solution to our in-house application. One of the goals of that integration is to involved more actively business and functional analysts, and even our clients, in the definition of processes within our application. The next step was then to implement a sample process in order to get to know Intalio and at the same time, confirm it actually fulfills our expectations. 1° Create an non-executable pool and name it "ForHRM-FrontOffice"
2° In the "ForHRM-FrontOffice" pool, create a task and name it "Trigger Process" : this task within the "ForHRM-FrontOffice" pool represents our application from which the process will be executed. 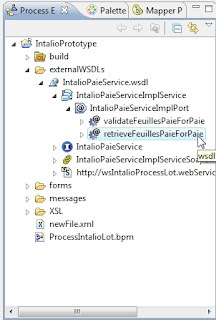 3° Create an executable pool and name it "ProcessIntalioLotProcess"
6° Still in the same pool, create a new task and name it "Invoke WS to retrieve data"
18° Focus on the "validateFeuillesPaieForPaie" task and drag the ingoing message flow icon to the "Invoke WS to update data" task. Then, drag the outgoing message flow icon to the "Invoke WS to update data" task. 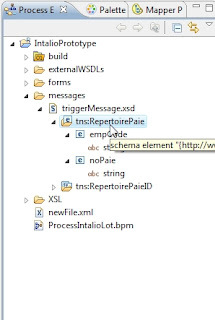 19° From the "messages" directory, expand the "triggerMessage.xsd" file and drag the "tns:RepertoirePaie" element onto the message flow that goes from the "Trigger Process" task to the "Start Message" event. 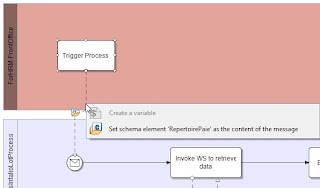 Then choose the "Set schema element ... as the content of the message"
This step defines the structure of the message that will be passed to the Intalio process when it is executed from our application. 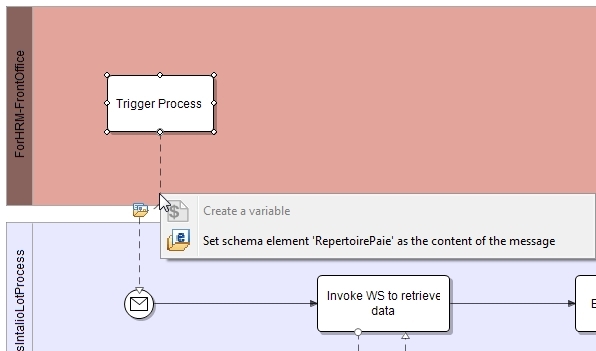 Since the "RepertoirePaie" element is composed of 2 String elements, the process will be executed by calling a web service operation that receives 2 string parameters (read further for more details on that). This step defines which are the values and where they're actually come from, that will be passed as parameters to the web service operation. 21° Focus on the "Begin validation" task and open the "Mapper" View. 22° From the "Mapper Palette" view, drag the "doXslTransform" function into the work area of the "Mapper"
Then, within the "Mapper" view, create a new operator (by clicking on the red button from the "Mapper" View) and define its value as ""/XSL/feuillePaie.xsl". 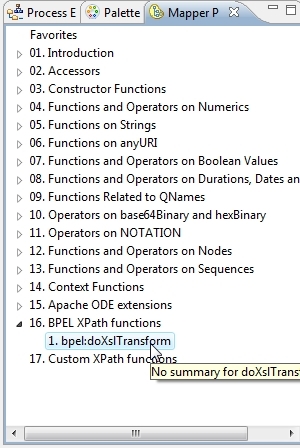 Connect this operator to the "bpel:doXslTranform" function that you just drag-and-dropped. 23° My sample project (that can be downloaded with the link provided further) comes with all the .XSL files completely written. Here's how I've created them. First, create an empty directory within the project and name it "XSL". 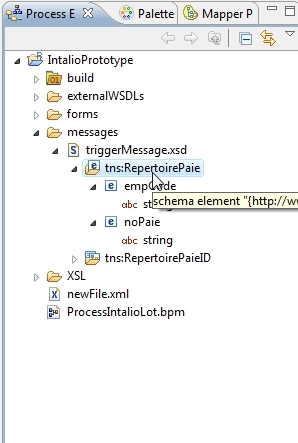 Then create an empty file and name it "feuillePaie.xsl" and put this file in the "XSL" directory. Go back in the "Mapper View" and focus on the "Begin validation" task. 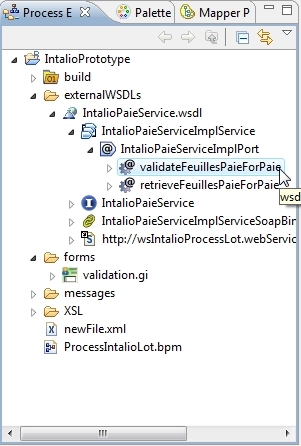 24° Focus on the "Invoke WS to update data" task, go to the "Mapper" view and configure the mapping as shown below. This time, I created an XSL file called "feuillePaieValidee.xsl" and I followed the same logic used at step 23° to complete that. So you should be able to get to the same result by yourself, I guess. In this step, what I've done, is mapping the content of my matrix table (that might have been by the "formatech/khy" user - did you see that I've defined a user on the pool that contains the forms ???) 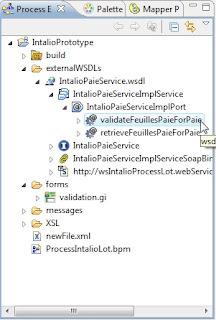 to the input parameters of the WS operation named "validateFeuillesPaieForPaie". In my sample, this operation will update the data that have been modified by the user through the Ajax form, into our database. This process is quite basic but embedded enough requirements in order to be integrated into an existing application (it actually was a good prototype for us to check that we could integrate Intalio to our in-house application), so feel free to base upon it to create your own prototype and discover Intalio by yourself. 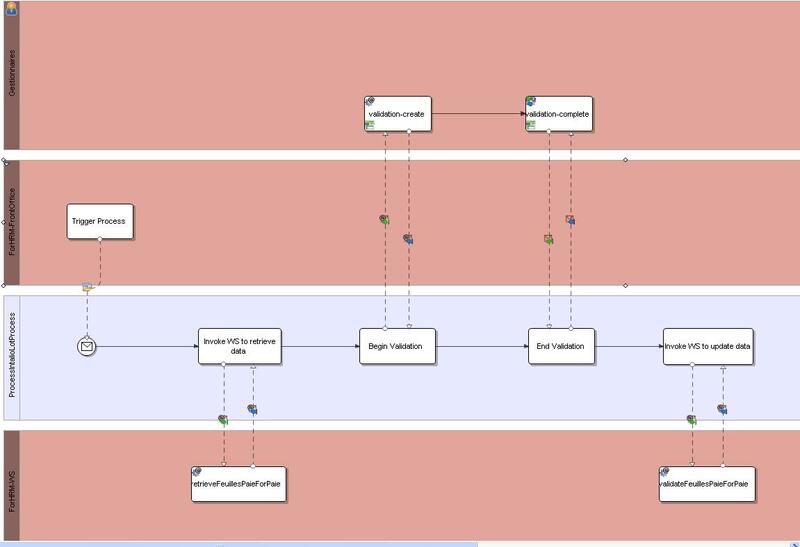 I've never followed any BPM training nor BPMN training, so don't take this sample as 100% correct from a functional process designing point of view. For those who would wonder why I did not send back a response to from the end of the process to the "Trigger process" task, here's the reason : once integrated into our application, if the "Trigger process" task were sent back a response message, the execution of the process would have been synchronous. Consequently, the user would have to complete the task within the UI-FW console before the code from our application could resume its execution. If you have any question/suggestion, just leave a comment. PS : should this link die or my process be deleted from the website, let me know and I'll re-upload it. Hi KH yiu!! 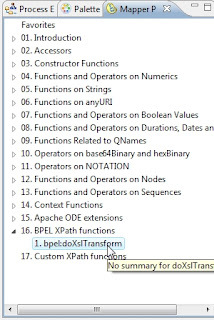 that's great news for me, i didn't know about xsl helper in intalio designer, i have tried to use doXSLTransform() but never got success in that, i'll try to use your post like a guide for handle data from a multiselect widget to another one, i hope it works. Hello! can you give a new link to download? Please!